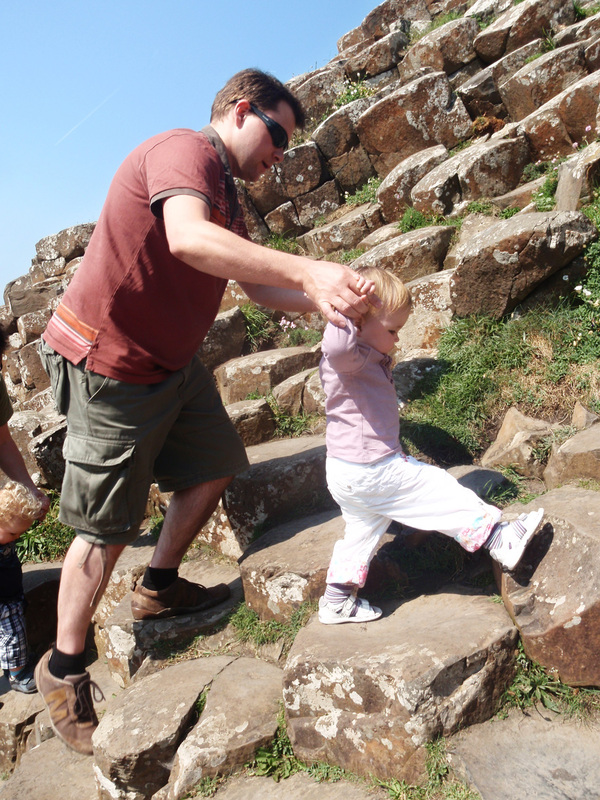 We took a little trip to NI with some good friends of ours, at the start of June. It was just a weekend trip but we had a fabulous time. Ali is from NI so we were going to stay with her parents in their family home. To make the most of the trip we decided to catch an early flight and this meant we had a very early start on the Thursday with us getting up and leaving by 3:45am to get to Birmingham airport. Our flight was at about 7am. We expected E to fall back to sleep in the car but the little monkey only slept for 20 minutes! Thankfully this didn't seem to affect her too much and she was well behaved in the airport and the plane, although the car journey could've been better. The flight went well and was very quick, though I have to say that I didn't enjoy being in a smaller plane with propellers! Coming out of Belfast City Airport is a breeze and I wish it was like that at all airports. Going back was a different story but we'll get to that later. We had hired a car so we went to sort that out once we had collected our bags, having booked it online beforehand with an independent company. It turned out that we were hiring a car through Budget. We decided to go for a Focus class of car as the prices were very reasonable, meaning we didn't have to compromise on space. We ended up with a Mercedes A160 which we both enjoyed driving although I don't think it had enough 'poke' for us to want to own one. We weren't too impressed with the Budget customer service though and seriously considered complaining, although we didn't in the end. The guy at the desk was rude, unhelpful, slow and made us quite paranoid about bringing the car back in an immaculate condition. I won't bore you with the details. So on our trip we spent equal time relaxing and sightseeing. 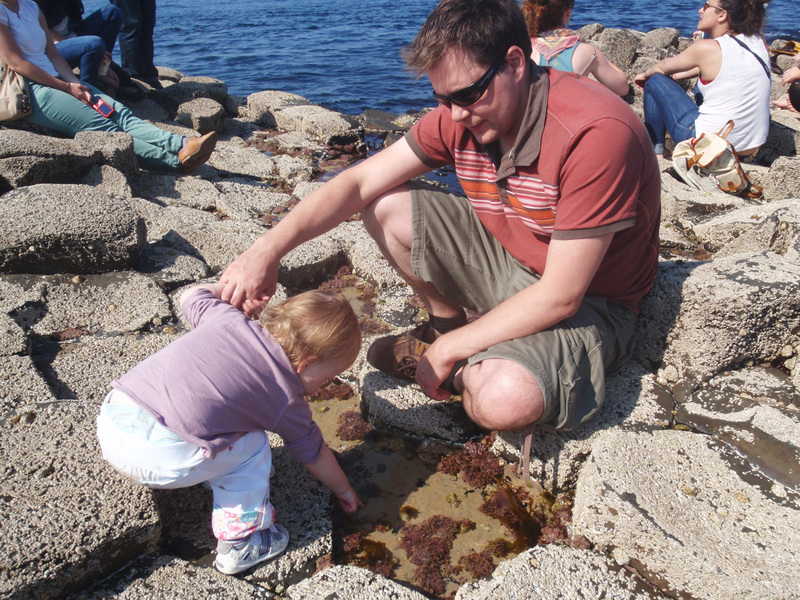 We were staying a short coastal walk from Bangor town centre and took the opportunity to walk in on our first day. We had somehow managed to leave the house that morning without any shoes for E so we had to go and do a bit of shopping. Oops! It was a lovely walk and we were lucky enough to have amazing weather, which actually lasted the whole weekend. I found it harder doing the walk than I expected as my Bump had got to the point of being slightly uncomfortable while my body was adjusting to its new centre of gravity. So lots of waddling and feeling tired for me. One shop we went into to look for shoes was a BHS type shop. We found a lovely pair of sandals for E - the only pair we liked that actually fit her - but we never got to purchase them. Frans Someone thought it would be a good idea to give the shoes to E to play with and she somehow managed to lose them. We looked everywhere! They had completely vanished so off we went to Clarks to spend a fortune. We ended up buying a gorgeous pair of sandals for her which were reduced so we weren't too annoyed and because they're white, they go with any outfit. Can't complain about that! 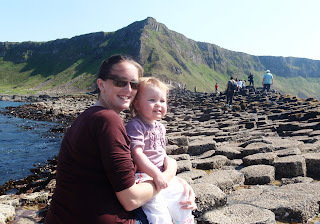 We also spent some time going up to and exploring the Giant's Causeway, something which I have wanted to do for many years. Again, the weather was beautiful and I was kicking myself for forgetting my 'proper' camera. 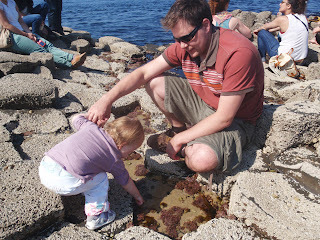 Instead we made do with the compact and E really enjoyed exploring the rocks with her Daddy. Such a wonderful memory. Lastly, we spent an afternoon at Mount Stewart, where the BBC were filming for "The Great British Story". There were talks, shows and lots of information and we were surprised that there weren't more people there. 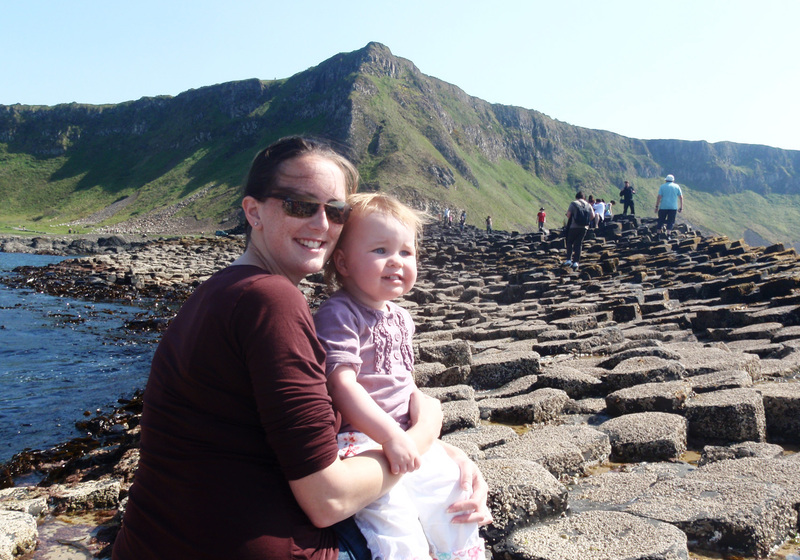 We could discover the history of Ireland and how the Vikings had come and explored the land. We had a great time! E wasn't too interested in anything other than the family trying to have a picnic with their baby and dog. She would frequently get distracted by another group and wander off, a recurring theme right now. She is truly in her element though when she's outside and she had a great time. 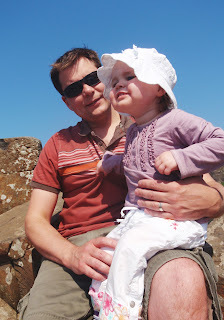 She also enjoyed the ice cream as we were leaving - thanks for that Uncle Rob! Our time spent relaxing back at the house was just as wonderful and we felt like we were long-time family friends. Elizabeth enjoyed bullying her boyfriend Alexander and they both had a fun weekend. We were so lucky with the weather as it could've turned out very differently if the toddlers had been kept indoors the whole time. So like I said, a wonderful weekend shared with friends, which we'll hopefully get to experience again and again over the coming years.